It’s hard to believe that the 2013 NHL season is halfway over. It seems like a couple weeks ago that we got our beloved game back from the stalemate that was the lockout. The first half of this 48 game season has been beyond exciting. Every game counts so much more than in the standard 82 game season. 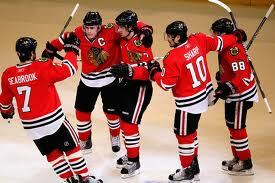 The story so far is the Chicago Blackhawks. They went 24 games without a regulation loss with the record of 21-0-3. That is an NHL record to start the season and is second to the Philadelphia Flyers (35 games) when it comes to consecutive games without a loss in a season. Jonathon Toews in my eyes is the best captain in the league. He is a leader in every sense of the word. Not only is he arguably the best all around player in the league, but he has a certain winners attitude and swagger that sets him apart from other captains. Not one team is further than 8 points from the 8th playoff spot so every team is playing their hardest in order to keep that spot or to achieve it. As expected the Boston Bruins and the Pittsburgh Penguins are in solid spots in the playoff standings. Surprisingly the Montreal Canadians are leading the NorthEast Division with 38 points. Boston is trailing by only one point with 3 less games played. The Canadians are led by electric defensemen P.K. Subban and receive contributions from rookies Alex Galchenyuk and Brendan Gallagher. Some star-studded teams like the Washington Capitals and the Philadelphia Flyers are under-performing to say the least. They both are near the bottom of their divisions and if the playoffs were to start today they wouldn’t make it. The Toronto Maple Leafs are the surprising team in the Eastern Conference. They are looking probable to make the playoffs for the first time since the ’03-’04 season. The Leafs are lead by sniper Phil Kessel and Captain Insano, better known as Dion Phaneuf. Although the Ottawa Senators lost their star and last year’s James Norris Memorial Trophy winner to a lacerated Achilles tendon, they still hold sixth place in the east. 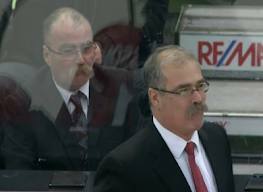 Their coach, Paul MacLean is a huge reason for their success. He has a great look-a-like as well! The New Jersey Devils are struggling as of late with arguably the best goaltender of all time on the injured reserve list, in Martin Brodeur. Another big story of the first half of the season is when the longest tenured head coach in the NHL was fired. That was the Buffalo Sabres Lindy Ruff. It was a rough end to his career, pun intended. He was trying to coach a team that just hasn’t been getting the job done. The reason he was fired was because the Sabres General Manager Darcy Regier and owner Terry Pegula thought that a change was needed. They have visibly put in more effort for their new coach Ron Rolston but just don’t seem to have what it takes to make the playoffs. Although the story of the Western Conference has been the Chicago Blackhawks, the Anaheim Ducks are leading the Pacific Division with 39 points. They are led by all around star Ryan Getzlaf and rookie goalie Viktor Fasth. The west is so close that three points separate fourth place from eleventh place. The Minnesota Wild acquired two top players over the off-season in left winger Zach Parise and d-man Ryan Suter. They are looking to keep the Northwest Division lead from the Vancouver Canucks who seem to win their division every year. The Detroit Red Wings lost their captain and one of the best defenders of all time in Nicklas Lidstrom and their powerplay specialist Tomas Holmstrom and are still fourth in the standings. The defending Stanley Cup champion winning Los Angeles Kings started the season off slow but have found their winning form as of late. 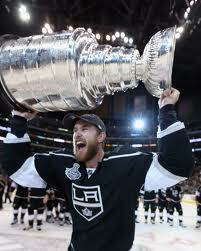 They have been getting big goals from sniper Jeff Carter and great goaltending as always from Jonathan Quick. Who will take their title away from them? We shall see. I'm just your average dude. I'm a sports enthusiast. I played hockey and baseball competitively my whole life. Buffalo Sports. Yankees Universe. Currently studying marketing. Buffalo, NY. I like to think of myself as a good guy. La Famiglia. Be happy and live life to the fullest! 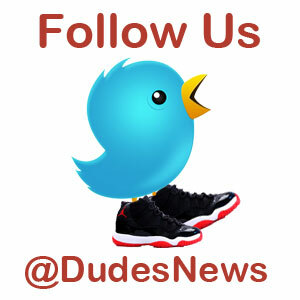 Contact me: matt@dudesnews.com or on facebook.